In the United States a cast-iron skillet is an institution and they're often passed down through generations. They're great for cooking up whole dishes in one pan - from a breakfast fry-up to T-bone steak. 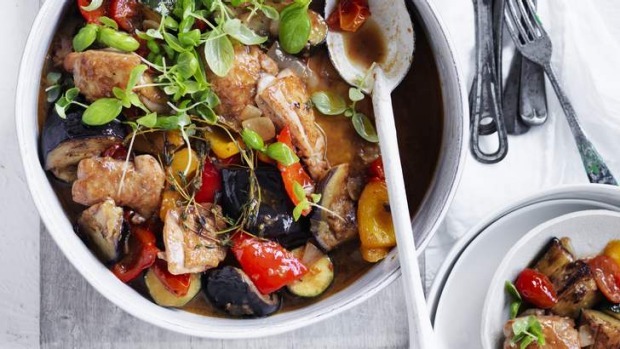 Perfect straight from the skillet (or iron casserole pot) this lovely chicken and vegetable dish can be served hot, warm or even at room temperature. 1. Halve the chicken thighs and season well with salt and pepper. Heat the oil in a very large skillet, frying pan or chef pan over high heat and brown the chicken well on all sides. Remove the chicken from the pan and set aside. 2. Add the anchovies, onion and garlic to the oil and fry until fragrant. Add the zucchini, eggplant and capsicum and fry until lightly browned. Add the tomatoes and thyme and stir until combined. Season with salt and pepper then return the chicken pieces to the pan, sticking them into the ratatouille skin-side up. 3. Simmer the ratatouille for about eight minutes until the chicken is cooked through. Remove from the heat and stand for at least 10 minutes before serving, scattered with the basil leaves.